We get another look at Ashley’s powers. First, she can’t summon a platform out of someone who’s “out-of-range”, which would include trying to hit the drums meant for Olivia and Eric right now. Second, she can summon cowbells that correspond with each platform color, and hitting it allows her to throw the platforms wherever she’d like. Sorry for the late update! My tablet was acting wonky, but it’s all good now. Really relieved that I was able to figure it out. I’m curious, if Ashley uses both sticks on Charlie’s Drum, would it create more of like a Frozone-esque way of traveling? As long as he was running, yes! The platforms would be so close to each other that they’d be touching, basically giving him a bridge to run along. Yeah but I mean if she did it fast enough so that the next platform’s center of mass would be at the end of the current platform forming kind of like a crescent shaped attachment to the existing platform incrementally. Oh, no. The platforms are always circles. A platform will never spawn overlapping with another one in space. If there’s already a platform underneath the target, the next platform will spawn under where it seems they’re GOING to be in the next half-second or so. Beyond that, don’t overthink it. 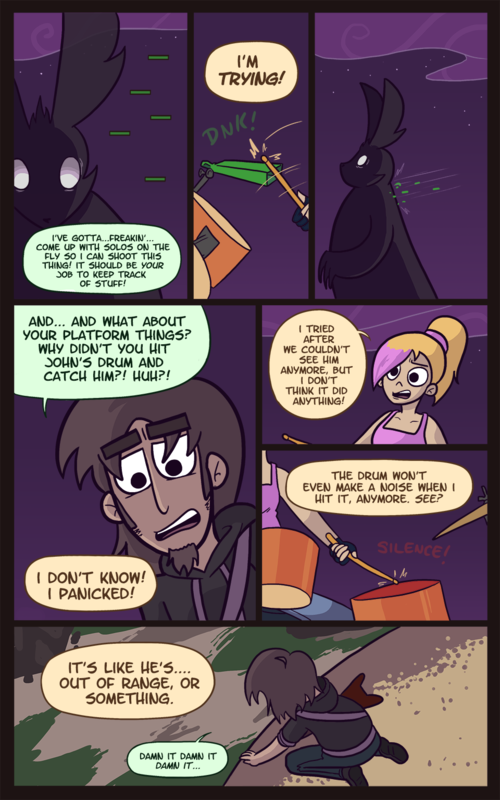 Silly fantasy comic with only a little logic behind the magic! I just thought there’d be something cool if Ashley could pull off a super fast roll.